It's a HOT time of year, and not just for Popsicle enthusiasts. We're all looking to get out and ride, and there are very few things quite as motivating as a fresh, shiny new bicycle, even if that bicycle has been previously loved. We really dig our trade-in program here at CDC, because unlike nearly everything else in the world it makes everybody happy. You've got a bike that's in good shape, with lots of life in, but a burning desire for something more; hey, that's good. We have plenty of that something more, and it even comes in different sizes. It's really simple. You can use BicycleBlueBook.com (which is available right here on our site) to get a good idea of what your bike is worth. Bring your bike into the store for a final, official valuation, and you'll have that value as a credit toward a brand new 2018 bike from Central District. And this June, we're making it even easier. We always offer a 3% cash discount on all bike purchases, but starting right now (which isn't even technically June!) you can take an additional 2% off when you go full Randy Moss and pay #straightcashhomie. That's right 5% off when you get a new bike with real money! There are some rules here. Your bike has to be cleaned up and tuned up; if we have to do loads of work on it, that value will be taken off your trade-in credit. We also ask that the bike is 2005 or newer, and sorry, we don't accept department store bikes or tandems. Tandems are great, but they take up twice as much room in a small shop as a normal bicycle. More DEETS here. As always, check out our list of in-stock bicycles and start drooling. Something you're interesting that's not on the list? Stop by, or give us a call and we'll track it down for you! It's beginning to look a lot like Christmas, and that means our list of cycling needs and wants gets a little longer...and a little bit more visible to ensure they all get checked off the list. Here's our in-house blogger/cyclist/bike nerd, Cody Sovis, wish list for December. 1. Kona Rove NRB DL. It may not be completely realistic to stick a new bike right at the top of the list, but I'm going to do it anyway. The Kona Rove NRB DL makes this list for a couple of reasons. First, I really do think this bike is the best value out there right now; for $2k, you've got an all-day road bike that, with another wheelset, can hop in a crit or do 100 miles. The stock wheels are 650b do-anythings that cover your bases for gravel, pavement, and a splash of trail. The WTB Horizons might be perfect for the new 100 mile gravel races in West Michigan next spring, namely Lowell's 100 mile option and the Psycho Killer and Barry-Roubaix. Secondly, this whole line up of bikes just makes more sense for how we ride today. There aren't many road or crit races left, and odds are that you already have a bike for those. I really can't imagine buying a drop bar bike that doesn't fit at least 40c tires on 700c wheels, or 2.1" tires on 650b MTB wheels. For the gravel, adventure, commute and majority of riding, having the flexibility to swap between two sets of wheels and invest more in a single bike with a nicer drive train simply makes sense. That's why I'd secretly love to nab the steel 'bling ship' version of the Rove, the LTD.
2. WTB Byway 47c. Right along with the Kona Rove, the Byway is a tire that blurs a lot of lines. Mounted to 650b wheels, it's a slick tire with just enough bite to be a capable and trusty rubber for tying in more trails to your normal gravel route. Especially for folks who love to ride to the ride, it's fast on the pavement and still a blast to toss around at Cannonsburg or other singletrack systems that aren't too rocky. 3. Serfas TSL-1200. Alright, full disclosure, I already have one of these. It's on here because it's been one of the best investments I've made for night riding, especially during cold and snowy fat bike rides. The external battery packs last longer than a single unit light/battery combo not just because they have more juice; being able to keep that battery warm in a frame bag or jersey pocket makes a huge difference. I leave my light on the bars and the pack in the frame bag almost all season, just grabbing the pack to charge up. Even on the coldest days, I can get 1.5-2 hours or two rides on a single charge at the second highest setting. That external pack also has some other good uses. It has a USB port, so you can charge your bike computer, phone, even your camera. I use it for traveling a lot, especially to bike races where I may not be in my car before, during or after the race and want to keep my phone with me. For big rides, such as my five hour epics during the #Festive500 during the holidays, I'll usually plug my phone in to make sure I can listen to my tune and make an emergency call for a ride home, should worst come to worst. 3. Winter Rush Registration. This would be a great thing to unwrap! Get your fat bike friend all signed up for a fat bike race this winter and keep them motivated to put some miles in even in some colder weather. There are dozens of fat bike races and rides all over the state, and even across the Midwest with the Great Lakes Fat Bike Series. Of course, we're a bit partial to Winter Rush, which will include a race at Big M on January 13, plus the USA Cycling Fat Bike National Championship at Cannonsburg in February. 4. Velocity Aileron US Build. You can never, ever, ever have too many wheels. I've had a ton of luck with the Velocity Ailerons, but I've never gotten my mitts on a USA build. It's about as American as you can get, with Aileron rims laced up to Industry 9 hubs. Tough, light, and they set-up tubeless exceptionally well. 5. Snacks. Seriously. I go through a ton of Hammer Fizz in a week, and nothing would jingle my bells like getting a pack of grape Fizz that would have be set for a few months. Having a few gels, bars, or bloks on hand are always nice, and if you've got a cyclist with a special favorite, grab 'em a box. You'll totally make their day. 6. A Get Out Of Jail Free Card. This one doesn't cost you a dime. Give your cycling spouse or pal one coupon to let them skip something in favor of a ride. It could be dinner with the in-laws, watching a romantic comedy, or a visit to your Aunt Mertyle's. Here's the thing about this card, though; you don't get to hang it over their heads after they use it! 7. A Tune-Up. Especially once the snow flies, it's a great time to get your road, gravel or mountain bike in the shop for a well-deserved overhaul. CDC is offering 20% off all parts and labor, so if you book your big tune now with a gift card in that amount, it'll still be a surprise under the tree that will make them happy all spring long. What are you hoping for this Christmas? Let us know in the comments and we'll make sure we get it in stock! We're all about bikes that open up new ways, places, and options to ride. The much-loved Kona Rove has already built a cult following around the go-anywhere, do-anything platform. It's no surprise that we were pretty darn pumped when we saw the full Rove offering for 2018! There are now NINE options on the Kona Rove, making it easier than ever to select the build specifications for how you ride. The Rove used to provide a different spec compared to the race-oriented Private Jake. With the PJ on hiatus (we'll miss you) the Rove gets to open up its offerings to include a more 1x and 2x builds, plus a whole new wheel size. First, the Rove starts at just $850 for the aluminum, Shimano Claris rig with 700 wheels. There's no better way to get onto a do-it-all drop bar bike, and one that is truly ideal for commuters. The next big jump is to the Rove ST, the classic steel frame option that we absolutely fell in love with. That boasts the ease of a Rival 1x drivetrain and essential offer a Private Jake build on a steel frame, with very similar geometry. Here's the real jump. For 2018, Kona went all in on all-road, offering up Road Plus options utilizing WTB's 27.5" wheels and Horizon 47c tires. The wheel size allows for wide tires that can handle singletrack, loose sandy roads, and massive days of exploration. Especially in Michigan, this wide footprint makes a big difference, especially for linking together gravel and trails by pavement without feeling sluggish. 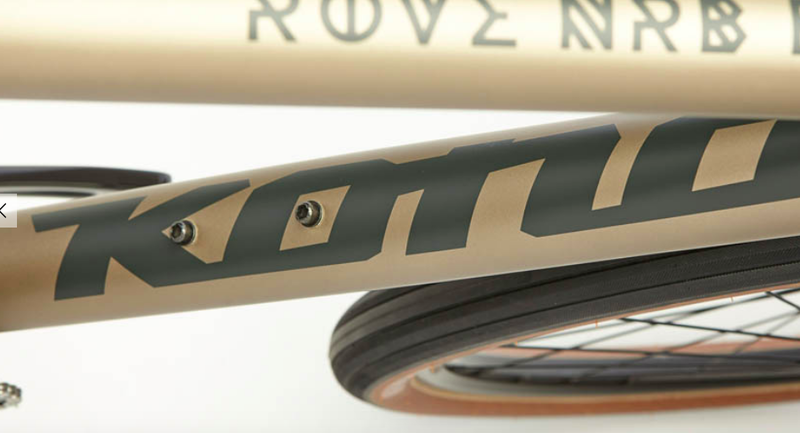 Kona offers three Roves with Plus Road wheels out of the bikes, starting with the Rove NRB. The Rove NRB DL gets you into Shimano 105 and, for our vote, is the best bang for your buck of the whole enchilada for $2099. The blingship of the line-up , however, is the Rove LTD. It's Reynolds 853 steel, Force 1 drivetrain and WTB's KOM carbon wheels in the 27.5" size as well. You're going to see more and more of the Rove and all of Kona's 2018 in the shop, so make sure you swing by! Watch our Facebook and Instagram to see what else we're building up. More choices and more widths make plus bikes more adaptable. Dedicated 29+ and 27.5+ (or B+, if you're down) rigs are becoming more and more popular, and for good reason. More tire means more aggressive cornering, better floatation in sand, more traction when you're out of the saddle and scampering up a climb, and smoother than more traditional 2.25" tire widths on narrower rims. There's been a big gravitation toward plus bikes, and a big part of that is the massive increase in rim and tires options. From in-house brands to components specialists, the options are almost endless on rims, rubber and even what you can do with the bike itself. But just as exciting as the options are what that plethora of choice has done to the price points. For a long while, even inexpensive plus wheelsets were at or above $1000. For 2017, the options for complete bikes is only a little bit more, and what you get is a whole lot of bike that will be a whole lot of fun. Kona went all in on plus, with options on the famed Honzo and Kahuna framesets to choose from. The Honzo is one of the most talked about, trail-shredding bikes around, and armed with that geometry, the guys at Kona went crazy. Perhaps leaning toward that trail pedigree, they developed a BOOST (148 rear hub) spaced rear end and the slack headtube that made the Honzo so fun, tossed on a 120mm travel fork, and dialed in the rest of the geometry to balance the new wheel size and the beloved ride qualities of the original Honzo. Because the actual diameter of B+ is so close to a 29er, the tweaks are really small, and the characteristic carry-over nicely. The 2.8" Schwalbe Nobby Nics seem to be the choice, and Kona does tend to err on the side of shred-ready rather than race ready. The Nics are an aggressive tread, a good option for singletrack lovers and riders that rely on a side knob to keep them out of the trees. For other, more weight conscious riders, something like Schwalbe's Rocket Ron in a Liteskin will save few grams, but still offer a predictable and grippy tread. The Big Honzo is a smart mix of SRAM's GX and NX component groups, so it's always going to be 1x11. The stock 30t might be a touch light for West Michigan, but it's a good chance to grab yourself a Wolf Tooth or Absolute Black oval ring in a 32t or 34t. And yes, it comes with a dropper post. Because they're awesome. 2017 Kona Big Honzo...with a drappah! Of course, that 120mm fork might be a bit much for you, and that's where the Kahuna comes roaring into play. The Big Kahuna is asimilar story; take a proven and tested geometry, just tweak it to account for the subtle difference in tires, and then toss that 100mm, race-ready fork on the front to take the worst of the trail off the ride. We've spent some time, and the added volume of a wide tire does help with some vibration reduction, although it's certainly no substitute for true suspension. A shorter travel fork like the 100mm, combined with that 2.8" tire at correct trail pressure (think 9-12psi for a 150 pound rider) and you've got a stable, fast rig that would punch you in the throat. The Big Kahuna does come with a 2x10 Deore drivetrain, and there are certainly some people that will drop it pretty quickly to a 1x10. We say go for it, and hey, maybe upgrade to a dropper seat post, because at $1399, it's ready to go off the floor, but what's the fun in that? One of the very cool things about how Kona went about their plus bikes is how they present and spec the bikes. They don't treat them as some exotic, strange, otherworldly new thing that's foreign. Essentially, the plus bikes in the Kona line-up are just different builds of proven bikes in the Honzo and Kahuna line-up, right there as options next to the Honzo AL/DL or Carbon Trail. They're another choice for another kind of rider, or another kind of ride. There's a lot of credibility in that, and we really dig it. Our first Overnight 24 hour camp out by bike by all accounts was fun. And for a few, a test of equipment and self fortitude. We started at Pioneer Park, a county campground on the north side of Muskegon. The water level in Lake Michigan is high, but the first 5 or so miles along the Lake were relatively easy. I settled in at 8 and 10 lbs of air pressure in my tires and spun on. Around 7 miles in we encountered the first set of seal wall and old dock pilings. Usually these can be rode around and through, not so much this year. We walked and floated a good mile of the Lake. As the dunes flattened back out the beach was rideable again and we speed off to Duck Lake. After a brief refuel, we decided to ride on the Lake rather than riding the scenic road into Whitehall. The next few miles were mostly more walking and floating until we abandoned the route at the invite of a friendly innkeeper. From there we rolled into Whitehall. Well almost. Charlie's pedal fell off and he one legged into town. In Whitehall we met up with the other half of our group, the roadies. Deeply involved in a game of jenga, we chilled at Fetch Brewery while Charlie hooked up a pedal fix at the hardware shop. A bit of dinner and we were off for our campground destination Meinert Park. The 7 miles of beach were fantastic to ride after the long slog after Duck Lake. Hard packed sun and no obstruction. Perfect. Meinert Park proved to be a perfect bike packing campground. Hot showers and beach access. On the ride back we rode the beach to Whitehall and then rode scenic drive to the White Lake Inn for second breakfast. After second breakfast we decided to ride it out on scenic drive to get back for Father's Day. Our next trip is to Marquette over the 4th of July. Overnight, 24 hours camp out by bike. A simple journey along the coast of Lake Michigan. 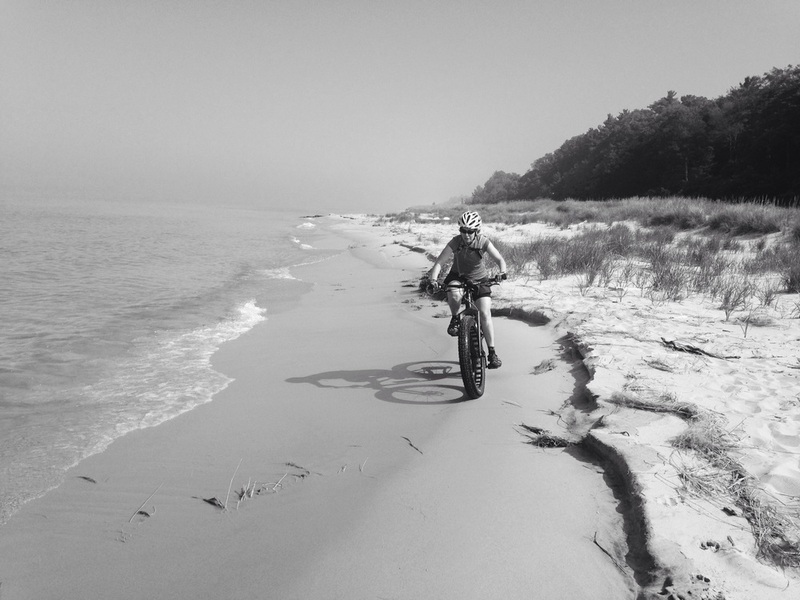 We will travel north out of Muskegon on one of two travel plans, one on the beach (we recommend a Fatbike) and the other option, lakeshore roads. All to end the ride at Meinert Park campground. (We have site #59 reserved). Along the way we will stop in Whitehall for refreshment at Fetch Brewery. We will return the following day via the same routes. Estimated travel time is 3-4 hours each way. Limited sag will be available. One small bag, like a tent, can be hauled for you. But this is an overnight of self reliance. Plan to carry most of your gear by bike. We also ask you to consider if this journey is appropriate for kids. Although the distance is not great, please note the emphasis on self reliance. Want in? There is no cost for the O24, but you will need to pay for your camping and foodstuffs along the way. 48 hour turn around on Tune-ups. Simply come in and schedule one of four levels of tune-up service. During the Month of March, upgrade a level 2 tune-up to a level 3 tune-up, which includes bike cleaning. *Upon drop off please allow time for us to assess your bicycle. Need special timing? Call and schedule a drop off that works with your schedule.